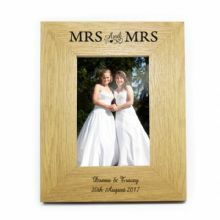 Personalise this 6x4 Mrs & Mrs Wooden Photo Frame. 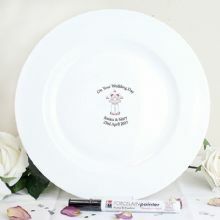 Personalise this Female Wedding or Civil Partnership Message Plate. 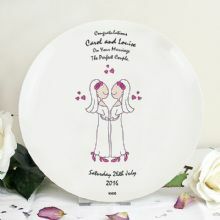 Personalise this Female Wedding or Civil Partnership bone china plate. 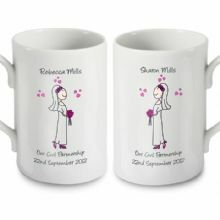 Personalise these Female Wedding Mugs. 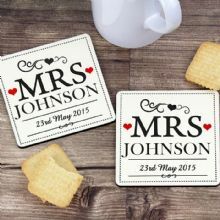 Mrs & Mrs Coaster Set. 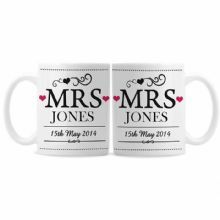 Personalise this Mrs & Mrs Mug Set. 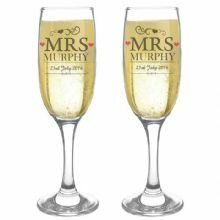 Personalise this pair of Mrs & Mrs Flutes with a surname up to 15 characters and date up to 20 characters. Personalise these comfy Mrs Velour Slippers.